After AzhwAr mentioned in the previous pAsuram that brahmA, rudhra et al were created by nArAyaNa, he was asked by some samsAris “It is well known in the world that brahmA, vishNu and Siva are the three deities for creation, protection and annihilation respectively; thus, while it is apt to accept that all three are supreme beings, could you say that only nArAyaNa is the supreme being?”. AzhwAr responds in this pAsuram through the path of ithihAsams (epics). therungAl dhEvan oruvanE enRu uraippar – if one were to analyse with the assistance of pramAnas (authentic texts) the wise sages will say that the supreme being is only one and that he is SrIman nArAyaNa. The wise sages established that “thathvam jigyAsamAnAnAm hEthubis sarvathOmukhai: I thathvamEkO mahAyOgI harir nArAyaNa smrutha: II” (those who desire to know the supreme being think that it is only nArAyaNa who is a mahA yOgi and is known by the name hari, who is the only supreme being, for a variety of reasons). Thus AzhwAr says that the claim of samsAris that there are three supreme beings is incorrect. Arum aRiyAr avan perumai Orum poruL mudivum iththanaiyE – Has it not been mentioned that the greatness of supreme being is not known to brahmA, rudhra, great sages such as sanaka et al and to himself [emperumAn] who is the controller of all, in various authentic texts! EthAvA nasya mahimA athO jyAyAmScha pUrusha: – is this all his greatness? Is that supreme being not greater than these! na sa Sakyas thvayA dhrashtum mayAnyair vApi saththama I sarvEshAm sAkshibhUthO’sau na grAhya: kEnachith kvachith – Oh child rudhra! That supreme being is not apt to be known by you or by me (brahmA) or by anyone else. He knows everything, being the witness to everything. This supreme being is not capable of being known by anyone at any point of time. vishNusdharmam says “na yasya rUpam na balaprabhAvau na cha svabhAva: paramasya pumsa: I vigyAyathE sarvapithAmahAdhyais tham vAsudhEvam praNamAmyachinthyam” – I salute that vAsudhEva whose divine form and basic nature are not known to brahmA, rudhra et al and who cannot be known. yannAyam bhagavAn brahmA jAnAthi paramam padham I thannathA: sma jagadhdhAma thava sarvagathAchyutha II – Oh achyutha! We salute that divine form of yours, being the final refuge and sustenance for the entire universe, which bhagavAn brahmA doesn’t know. 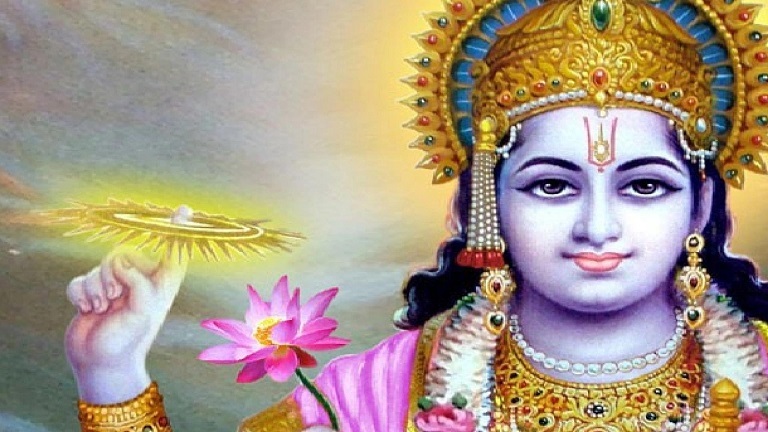 yan na dhEvA na munayO nachAham na cha Sankara: I jAnanthi paramESasya thadh vishNOr paramam padham II – we salute that vishNu who, being the final refuge and supreme lord, who is not known by dhEvas (celestial entities), sages, me (brahmA) and Sankara. AzhwAr was asked “We hear that brahmA, rudhra et al grant great benefits to those who carry out penance towards them; hence, can we not take it that they are also supreme beings?” He responds..
eththavam seydhArkkum aruL mudivadhu AzhiyAn pAl – irrespective of the extent of penance carried out by anyone, the final benefit is granted by the one who carries the divine disc. AzhwAr says that even if one carries out penance towards brahmA, rudhra et al, the benefit is granted by SrIman nArAyaNa, as the indwelling soul of brahmA, rudhra et al. aruL mudivu adhu – those benefits which are accrued through (emperumAn’s) mercy. Thus, AzhwAr, in this pAsuram, established that nArAyaNa is the supreme lord and brahmA, rudhra et al get their benefits granted by nArAyaNa only. We will take up the 3rd pAsuram next. This entry was posted in iyaRpA, nAnmugan thiruvandhAdhi on June 18, 2018 by T N Krishnan.